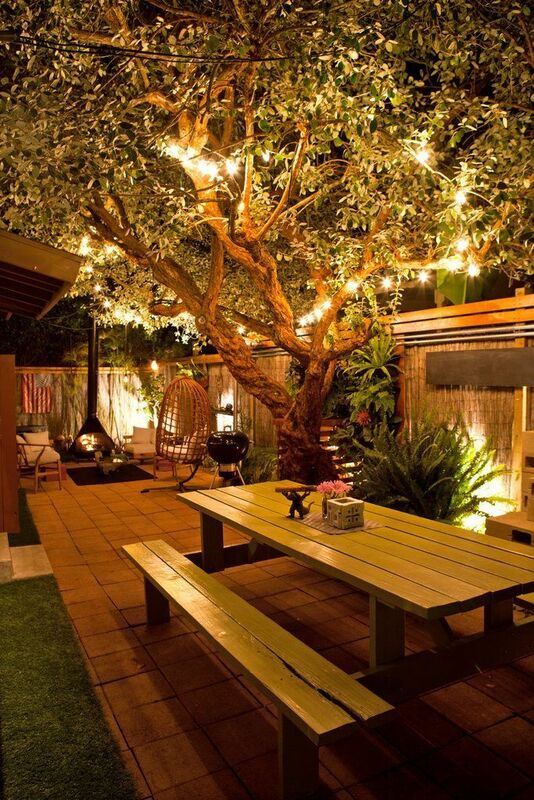 The shade pivots around the connection point, so the light can be turned to face different directions. These colours can be mixed and matched to form various compositions, including an all-black design. The main body of the container is hand-blown glass in the shape of a simple bottle with its neck removed. 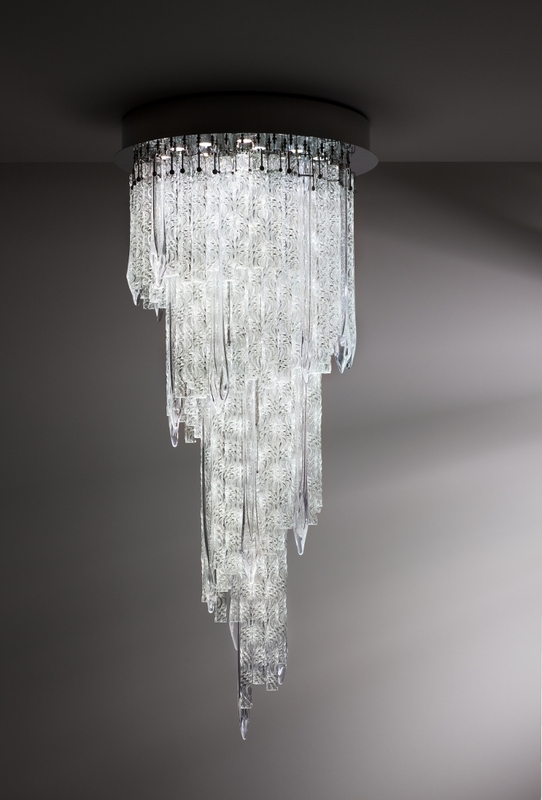 Additional floor lamps, shelf lights, small tabletop lights and bowls also made from marble and glass will follow to form a collection of similar products. 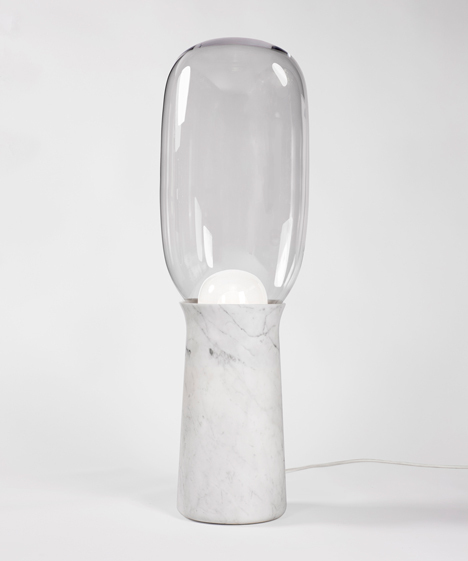 Yeffet’s previous designs include a floor lamp with a hand-blown glass top and a marble base. 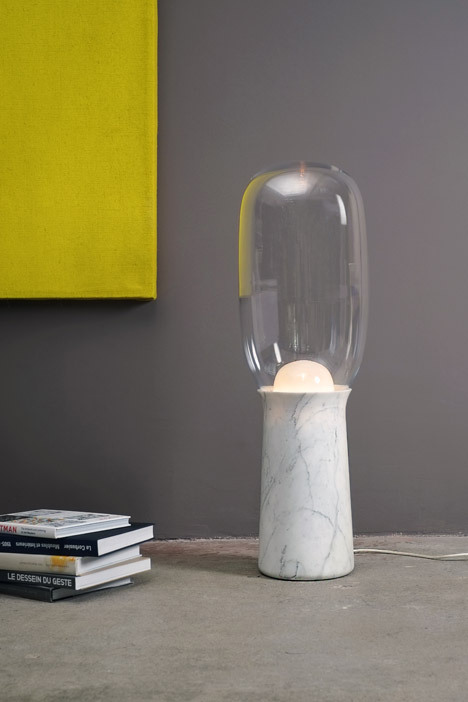 The designs continue a revival of marble in contemporary furniture design that Dezeen noticed during Milan design week in April. Pieces unveiled during the event included a table collection by Scholten & Baijings, vessels by Lee Broom and a version of Alessandro Mendini’s iconic Proust chair. “The form of each element was inspired by the raw materials, the classic way we perceive them, and for each one the way I perceived it,” he added. 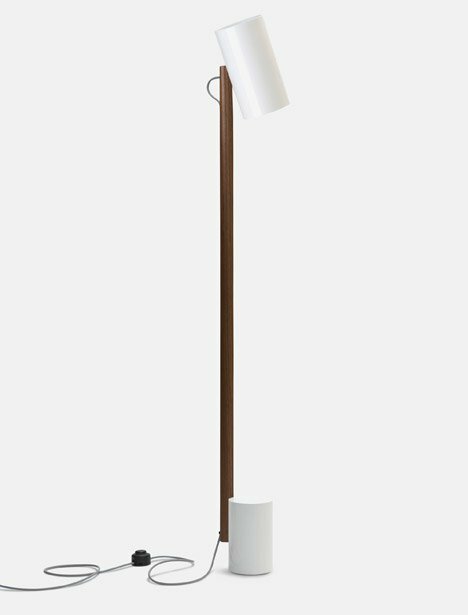 “Quart is a reading or directional lamp friendly to contract and residential settings, with a swivelling shade that can be directed as needed,” said Rich Brilliant Willing. 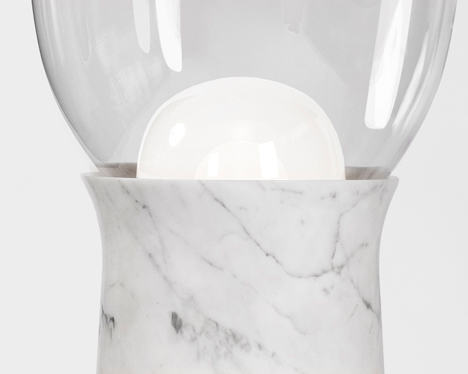 Marble is currently enjoying a revival in contemporary design. 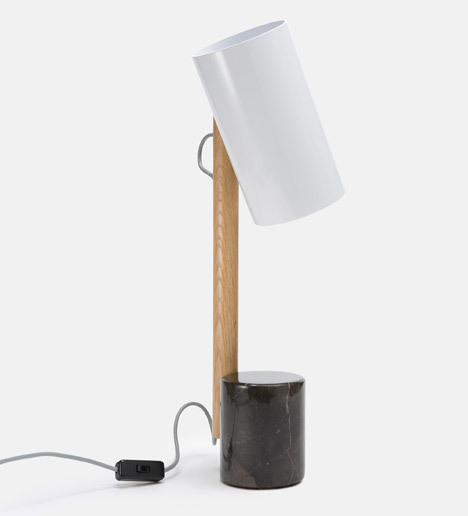 Recent projects we’ve featured that use the material include a lamp that pairs the stone with blown-glass top and a collection of products made from unwanted marble tiles. The electrical cord is embedded into the wood, running up the back of the pole before looping out and into the shape. 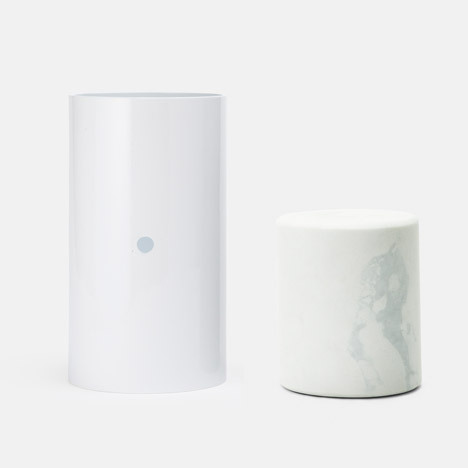 “Comprised of simple cylindrical volumes, its minimal footprint is anchored by solid stone and highlights any moment in your home or workspace,” said the brand. 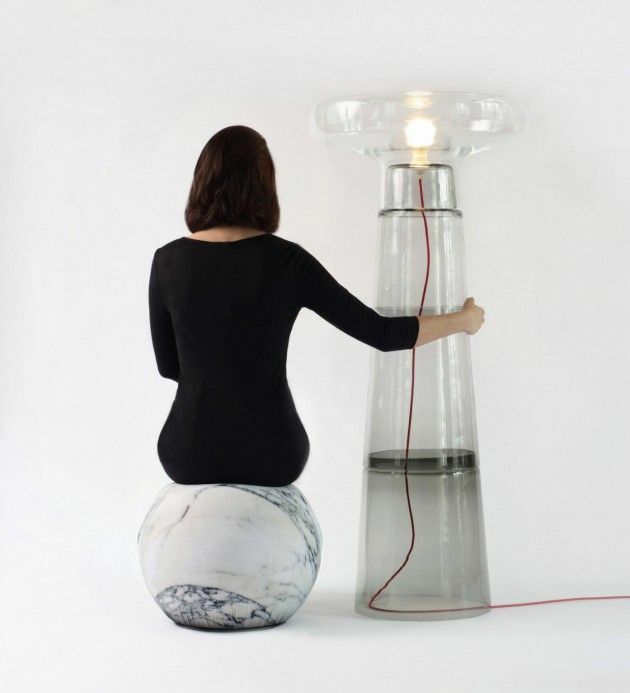 Israeli designer Dan Yeffet has paired a blown-glass top with a marble base to create this statuesque floor lamp. 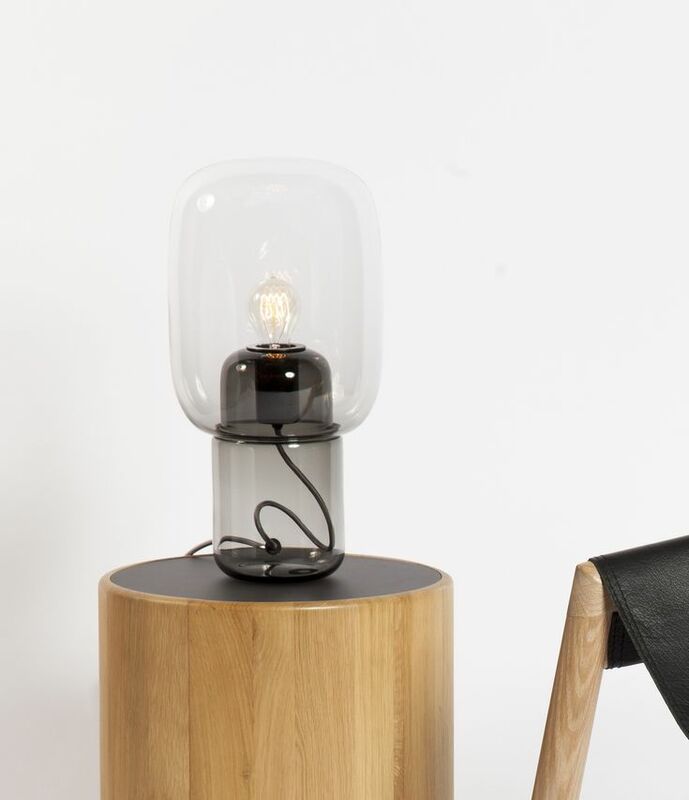 Finish options include a white or charcoal marble base; a walnut, oak, black-painted oak wooden stem; and a white or black aluminium shade. 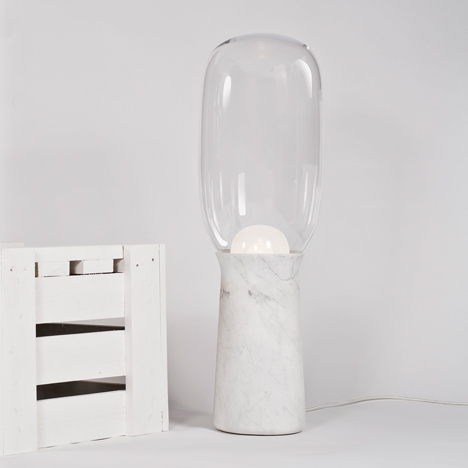 The marble is shaped using computer numerically controlled (CNC) technology and finished by hand, and the glass is hand-blown. 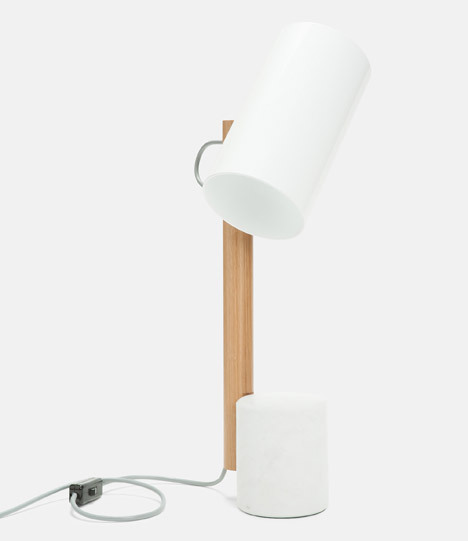 Two cylinders are joined by a wooden pole to form this lamp by New York studio Rich Brilliant Willing. 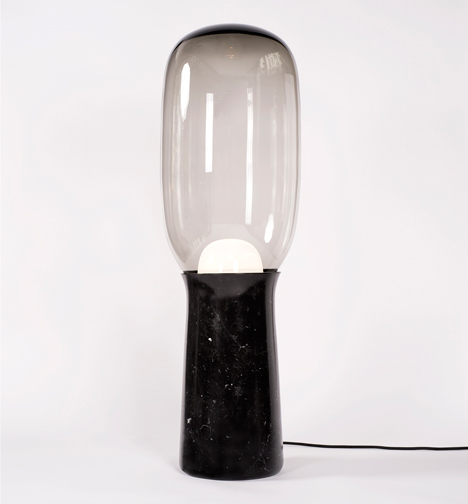 Dan Yeffet’s Torch Lamp comprises a vase-like base with an opaline diffuser that peeps over the top. 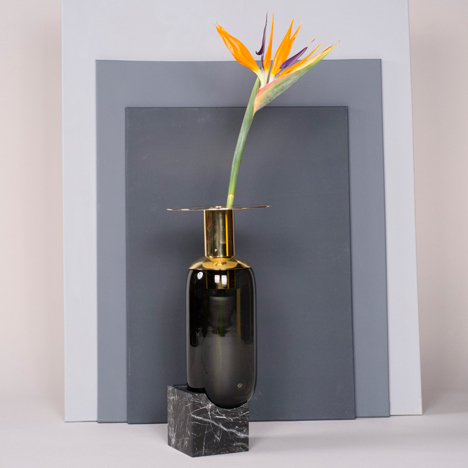 Yeffet hopes people will form a connection with the vase, whether they use it decoratively or for its intended purpose. 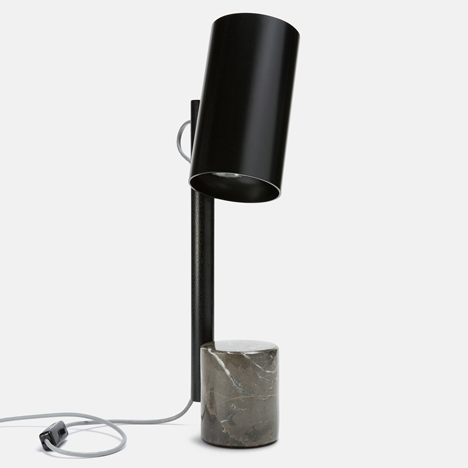 Lamps in Rich Brilliant Willing’s Quart range all comprise a solid marble base and a similar-shaped aluminium shade. 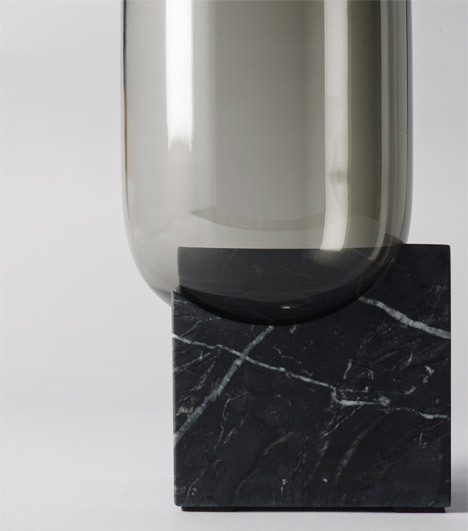 Using computer numerically controlled (CNC) technology, the base of the vase is cut from black marble into a cube with a void in the shape of the base of the bottle in one corner. 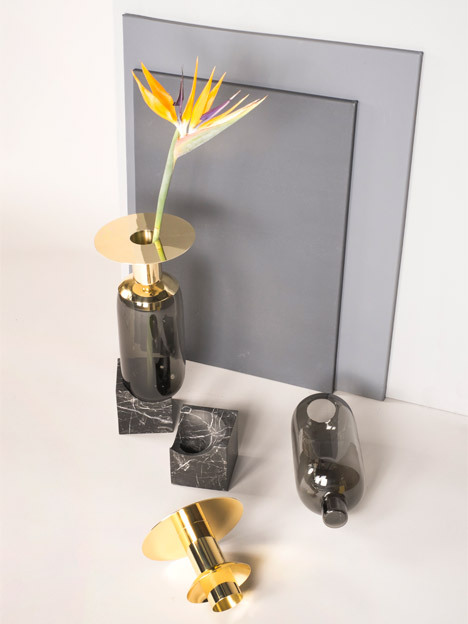 Elements launched at Maison&Objet in January 2015, alongside Sumo, a wooden side table with a marble tabletop and Embedded, a fruit bowl made from a geometric brass or stainless steel net on a marble base. 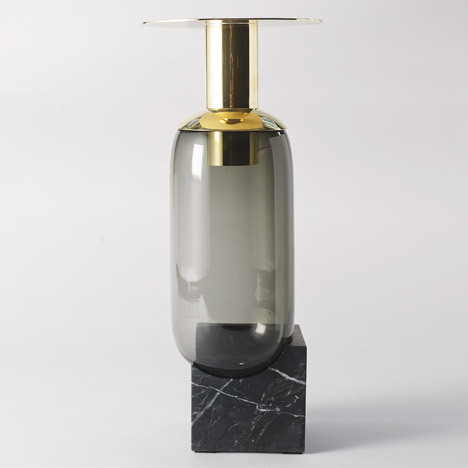 Maison&Objet 2015: a hand-blown glass vessel with a brass cuff perches on the corner of a black marble cube to form Israeli designer Dan Yeffet’s Elements vase (+ slideshow). 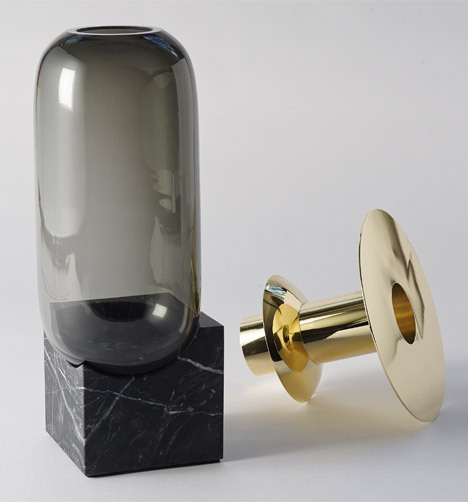 A hand-formed brass cuff sits over the top of the bottle, creating a decorative and functional object – part of Dan Yeffet’s Collection Particuliere. These two elements are connected on one side with a wooden stem, fixed halfway up both sections. 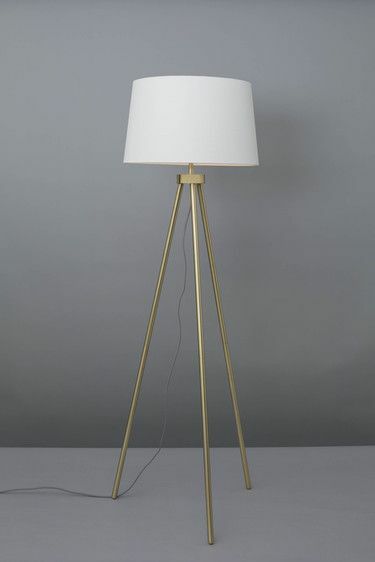 The lamps are available as a compact table model or as a floor version with an extended stem. 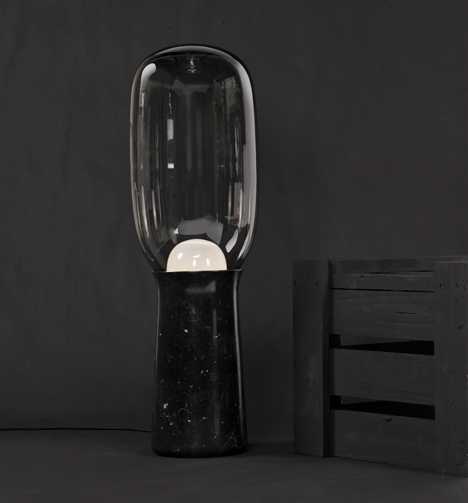 The lamp is available with a white Carrara marble base and a transparent glass top, and a black Marquina marble base and a grey smoked-glass top. 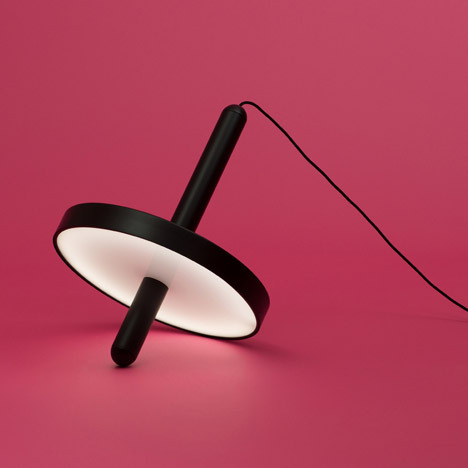 “The original brief was to create a unique lamp with noble materials, up-to-date design, a timeless style and my design signature,” Yeffet told Dezeen. 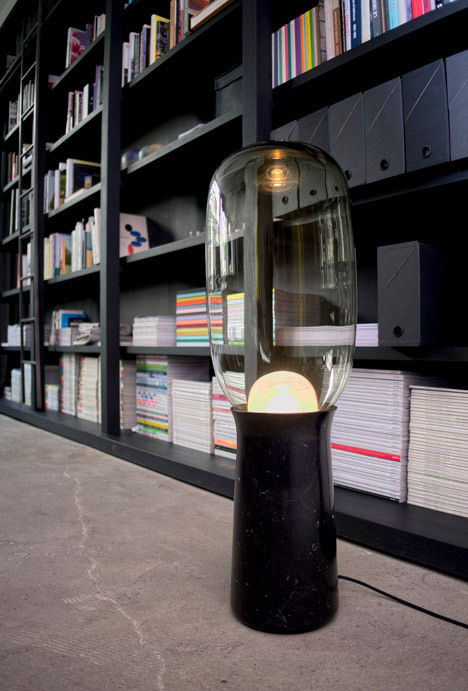 A stretched glass bubble sits on the base and doubles the height of the light, designed to rest on the floor. “When I started to build the idea in my head, creating initial sketches, I instinctively thought about what it could be and what other objects might create a dialogue with it, so a collection started to grow and take shape almost immediately,” said Yeffet.